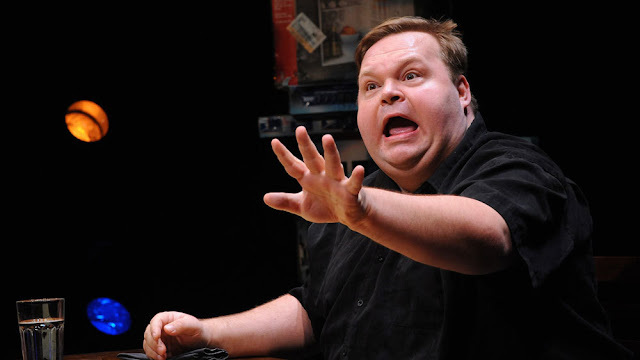 Mike Daisey takes on the reigning world heavyweight of self-mythologizing, the short-fingered vulgarian who captured a nation’s heart through bullying, charm, one-syllable explosions, and occasionally telling the brutal truth: Donald J. Trump. Daisey tells Trump’s story from his earliest days, tracking him as he makes himself into a new American archetype – the very first rich man famous exclusively for being rich. 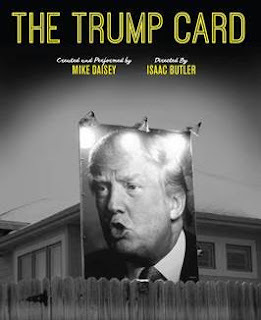 Instead of dismissing Trump as a simple con artist and huckster, Daisey breaks down what makes Trump tick – and in doing so illuminates the state of our American Dream and how we’ve sold it out. Daisey, who has been hailed as “the master storyteller” and “one of the finest solo performers of his generation” by The New York Times, is the preeminent monologist in the American theater today. He has been compared to a modern-day Mark Twain and a latter-day Orson Welles for his provocative monologues that combine the political and the personal, weaving together secret histories with hilarity and heart. He’s known for art that reinvents the form, like his critically acclaimed 29-night live theatrical novel, All the Faces of the Moon, a forty hour performance staged at the Public Theater in New York City. He has toured across five continents, ranging from remote islands in the South Pacific to the Sydney Opera House to abandoned theaters in post-Communist Tajikistan. He’s been a guest on Real Time with Bill Maher, the Late Show with David Letterman, a longtime host and storyteller with The Moth, as well as a commentator and contributor to The New York Times, The Guardian, Harper’s Magazine, Newsweek, WIRED, Vanity Fair, Slate, Salon, NPR and the BBC. In a brief, meteoric career with This American Life, his appearances are among the most listened to and downloaded episodes of that program’s history. He has been nominated for the Outer Critics Circle Award, two Drama League Awards, and is the recipient of the Bay Area Critics Circle Award, six Seattle Times Footlight Awards, the Sloan Foundation’s Galileo Prize, and a MacDowell Fellowship. As a playwright, his transcript of The Agony and the Ecstasy of Steve Jobs was downloaded over 100,000 times in the first week it was made available. Under a revolutionary open license it has seen more than 150 productions around the world and been translated into six languages. Years later there are productions being staged all over the world every night from in Germany to Sao Paolo to mainland China. He is currently at work on his second book, Here at the End of Empire, which will be published by Simon and Schuster, and a 25-night full-length theatrical monologue adaptation of Howard Zinn’s A People’s History of the United States. You can find him on the web at mikedaisey.com, and listen to his free podcast All Stories Are Fiction, where you can hear many of his stories, on Soundcloud or at iTunes. Isaac Butler (Director) most recently wrote and directed Real Enemies, a collaboration with the composer Darcy James Argue and the video artist Peter Nigrini, which was commissioned by the Brooklyn Academy of Music for the 2015 BAM Next Wave Festival. Named one of the top ten live events of 2015 by the New York Times, Real Enemies will tour America, Europe and Australia in 2016. Previous directing credits include Brooklyn Babylon (BAM NextWave & tour), Greg Moss’s Reunion and Corey Hinkle’s Notes on a Disappearance (Playwrights Center), Clay McLeod Chapman’s olume of smoke (Virginia Commonwealth University, The Firehouse Theater, The Kraine Theater and others), and Joshua Conkel’s milkmilklemonade (Under St. Mark’s). He also directed the US Premiere of Line Knutzon’s First You’re Born, the first ever production of a contemporary Danish Play in English in the United States. His writing has appeared in The Guardian, Slate, The Fiddleback, American Theatre, Time Out New York, PANK, Blunderbus, The LA Review of Books and others. 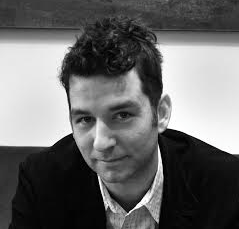 His first book, The World Only Spins Forward, a history of Angels in America co-written with Dan Kois, will be published by Houghton Mifflin Harcourt in 2018.